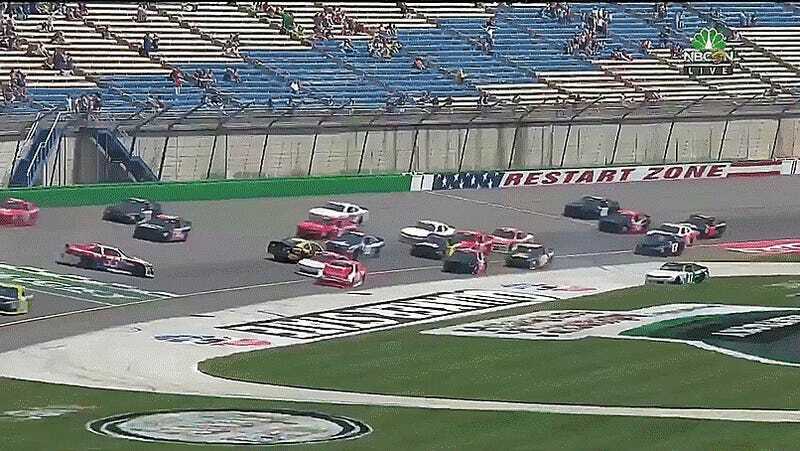 Before even half of the field could cross the start/finish line at today’s NASCAR Xfinity Series race in Kentucky, there’s already been a wreck. Come on guys, this is the easy part. What a start! Is there a record for quickest crash in NASCAR history? I suppose the only way to beat this is if the very first car spontaneously exploded. Perhaps the good thing is that the cars were still at just-about normal highway speeds when the cars started sliding—faster speeds could have resulted in more carnage. But come on, I just want to get settled before things start going off.